Priyanka Chopra tied the knot with Nick Jonas in a grand wedding in Jodhpur’s Umaid Bhawan Palace. The actor became the talk of the town and her wedding pictures took the internet by storm. It has been more than a month since her wedding and her celebration pictures are still doing the rounds on social media. Earlier today, PeeCee’s sister Parineeti Chopra shared few unseen pictures from the wedding where she can be seen with her brother-in-law. 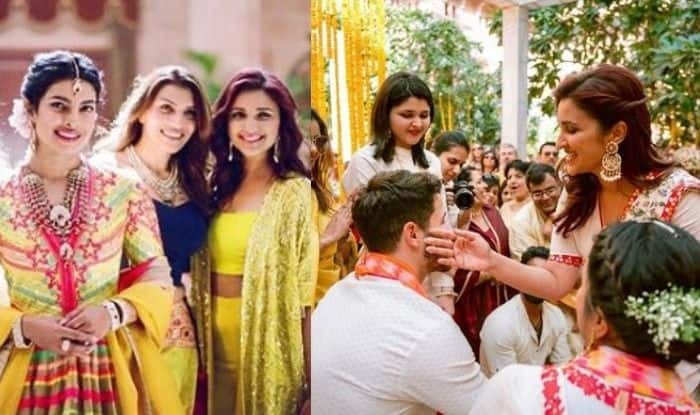 Parineeti who has lately taken out some time to share pictures from her sister’s wedding took to her Instagram to share a still of her applying haldi on Nick with a cute smile on her face. She shared two pictures from the haldi celebration. One with Nick and the other with the ‘Desi girl.’ She captioned the image as, “The girls.” She shared the other on her Instagram story and tagged Nick on it. 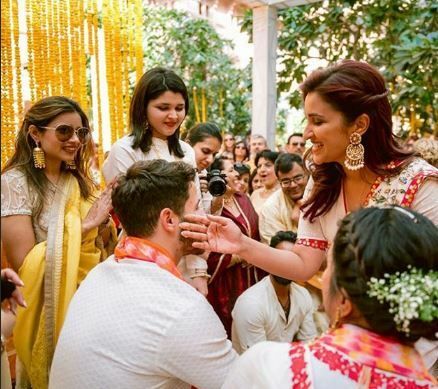 A few days ago, one of Priyanka’s friend took to her Instagram to share another set of inside pictures from PeeCee-Nick’s wedding. One cannot get enough of the snaps since it is filled with love, laughter and fun. On the professional front, Parineeti will next be seen in Dharma Productions film – Kesari, with Akshay Kumar. Kesari shows Akshay Kumar as Havildar Ishwar Singh, who led 21 Sikh soldiers against an army of 10,000 Afghan men. The story is about the Sikh leader who participates in the Battle of Saragarhi, while wanting to earn the respect of his estranged daughter. The film is set to release on March 21, 2019. Directed by Anurag Singh, the film is bankrolled by Cape of Good Hope Films and Karan Johar‘s Dharma Productions. Priyanka, on the other hand, will be seen in The Sky is Pink with Farhan Akhtar and Zaira Wasim.